Maybe it's coincidence, maybe it's in the stars, but two of Hawaii's foremost ukulele virtuosos are moving in opposite directions these days. Jake Shimabukuro has reined in his penchant for electronic experimentation and is concentrating on solo acoustic recordings. 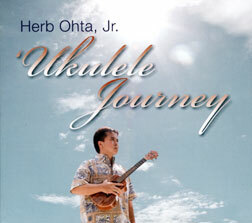 Herb Ohta Jr., revered for almost two decades as a proponent of unpretentious but precise technique over showmanship, signals his move into a new phase with this beautiful collection of recordings that feature the work of guest artists. Ohta doesn't need guests to do an album worth hearing, but they enhance his work here. Guitarist David Chino Montero adds a light melodic edge to Ohta's imaginative pop arrangement of "Waiting in Vain," Ledward Kaapana sits in on "Holo Wa'apa," and Daniel Ho is the pianist who joins Ohta on "Tsunami." Nathan Aweau, Barry Flanagan, Noel Okimoto and Jon Yamasato also join in. No matter who the guest is, the instrumental interaction with Ohta makes each selection interesting. The most memorable, though, is "Holo Wa'apa." Ohta has been best known for his extensive pop repertoire, but his work on "Holo Wa'apa" reminds us that command of Hawaiian standards should not be overlooked. 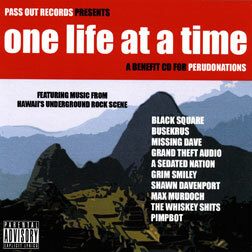 Eric Lagrimas and Pass Out Records are asking your kokua (in this case, your financial support) for a Kaneohe-based charity with this economically packaged and economically priced compilation. A portion of the proceeds goes to Lisa Sturm and Perudonations.org, a group raising funds to help two Peruvian boys in need of medical care. The title reflects the desire to make the world better "one life at a time." Black Square, Missing Dave and Pimpbot participate as the project's franchise acts. Each represents a distinct genre within the larger "underground rock" scene. Black Square opens with an aggressive call for "u-n-i-t-y" and freedom. Pimpbot adds the energy -- and the problematic audio quality -- of a club gig, with a live recording of "Ragga Muffin" that epitomizes the group's success in blending elements of ska and punk. Missing Dave provides a dramatic change of mood as synth tracks, drums, bass and twin guitars clash behind the angry vocals on "Wash Away My Tears." Almost all the other acts represent other distinct subgenres. Several seem certain to benefit from the exposure they'll receive. Grand Theft Audio makes a memorable contribution with the somber alt-blues intro to "I Don't Care." Studio effects add enigmatic elements as A Sedated Nation describes a life better spent indoors ("Literature"), and Grim Smiley moves the format to drowsy somnambulant alt-rock with "For Tomorrow." Order online at www.passoutrecords.com or buy the CD at events sponsored by www.Perudonations.org. Slack-key aficionados will welcome Stephen Inglis' collection of traditional and original mele recorded to honor his home island of Oahu. Inglis is joined on several selections by his kumu and mentor, Hawaiian slack-key guitar master Ozzie Kotani. Their work together on Kotani's arrangement of "Pua Lililehua" is not only beautiful as music but also is a noteworthy demonstration of what can be done when guitarists use different tunings in a duet. They use the same technique with equal success on "Pauoa Liko Ka Lehua." 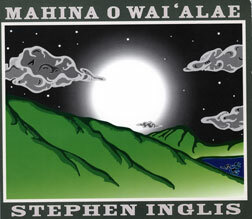 Inglis sings "Makee 'Ailana," his first vocal number, in a style that evokes memories of Keola Beamer and establishes his credentials as an artist who can sing in the old island style as well. Slack key is traditionally nahenahe (sweet, melodious) music, and he honors that tradition with every selection. And, although Inglis doesn't provide information about how these songs honor Oahu, slack-key supporters will applaud his decision to list the tunings and related modifications he uses on these beautiful recordings.